To format new hard drive or partition in Windows 8.1 / 10, please start the diskmgmt.msc! This elegant example of handling new hard drive is not only suitable for the latest Microsoft system, it can also serve as an example for Windows Server 2012 and even for Web Server 2016. Some actions may require administrative rights or permission to create disks! 1.) ... The handling of new hard disks under Windows! 2.) ... What should I pay attention to in the hard disk format? See also: ► Display the full path in the title bar of Win 8.1 ms-explorer! 1.) The handling of new hard disks under Windows! Press and hold or right-click an unallocated region on your hard drive and then click or tap New Simple Volume. You can reformat the hard drive in windows 8 or shrink Volume. (Image-1) Create new volume in Windows-8. (Image-1) Format new partition or shrink Volume in Windows-8. 2.) What should I pay attention to in the hard disk format? Beware of NTFS and exFat! NTFS and exFat is supported on Windows 10, 8, 7, Server 2008-2016. Meanwhile, there should also be support on Linux and Appel's Mac OS. Here you should check with external hard drives if the other operating systems also support the appropriate hard disk format. To sum up: NTFS is great for a Windows system disk, exFAT is better for use on removable media, and FAT32 should only be used if you want maximum compatibility with the variety of your devices. 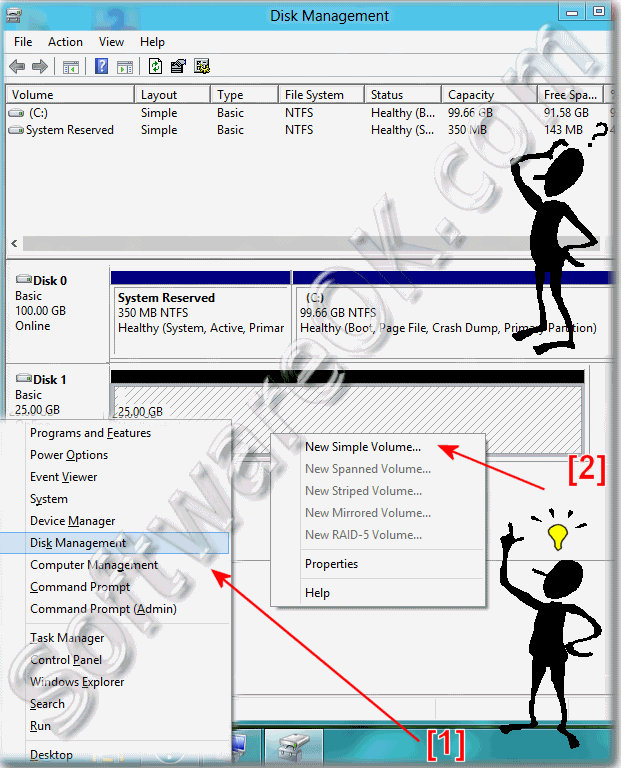 Windows-8 - FAQ-75: How to format new hard drive, create new partition/volume in Windows 8.1/10? Format windows 8.1 hard drive? How do i format windows 8.1 hard disk? Windows drive wont format in win 8.1? Format a new hard drive in windows 8.1? Format a drive on windows 8.1? Format a hard drive in windows 8.1? Formet c drive short key when instell windows8.1? How to format drive on windows 8.1? Hormatting hard drive for windows 8.1? How to format a disc for windows 8.1? What is the drive format for windows 8.1? How to format a disc on windows 8.1? Install window 8.1 and format drive? Premisson to format harddrive win8.1? Windows8.1 disk format, format disque win 8.1? How to format NTFS on windows8.1? Disk format utility windows 8.1? Formatting hard drives with windows 8.1? Formatting a disk windows 8.1? How to format hard drive using windows 8.1? Windows 8.1 drive format types? Formatting added drive in windows 8.1? How to make a reformat disk in window 8.1? How do i reformat a drive that had win 8.1 on it? Format disk with windows 8.1 installer? How to format hard disk in windows 8.1? How to find and format harddrives in windows 8.1? Win8.1 hard drive format type? How to format c drive in windows 8.1? Formating an existing windows 8.1 disk? Reformat hard drive windows 8.1? What disc format is windows 8.1? Format hdd for windows 8.1? Format disk in windows 8.1? How do I format c drive in windows 8.1? How to format hardrives in windows 8.1? How to partition a new hard drive for windows 8.1? Best way to reformat win 8.1 drive? Windows 8.1 disk format utility? How to reformat drive in windows 8.1? Formatting discs for windows 8.1? How to format disk drive in win 8.1? Format disk on windows 8.1.1? How to format hdd with windows 8.1? How to format a hard drive on windows 8.1? Formatting a drive in windows 8.1? Windows 8.1 format drive utility? Format windows 8.1 without cd? Command to format hdd on windows 8.1? How do you format a drive with windows 8.1? Format hard drive to win 8.1? W8.1 how to format drive? How to format hard disc with windows 8.1? How to reformat hard drive in windows 8.1? How to format drives in windows 8.1? Format a drive with windows 8.1 on it? Software for partition without formatting cdrive for win8.1? How do i find and format hard drives in windows 8.1? Reformatting hard drive windows 8.1? How to format windows 8.1? Windows 8.1 new hard disk formats? Format drives on windows 8.1? How to format the hdd in windows 8.1? How to format hard disk using windows 8.1? Format c drive windows 8.1? Windows 8.1 reformat hard drive? Formatting hdd on windows 8.1? Formatere harddisk i windows 8.1? Formatting a ram drive in win8.1? WINDOWS 8.1 FORMATTING HARD DRIVE? FORMATTING HARD DRIVE IN WINDOWS 8.1? How to format harddisk use in windows 8.1? How to format a new hard drive in windows 8.1? How to format windows 8.1 without cd? Windows 8.1 how to format a drive? How to formate window 8.1 with cd? How to create partition of hard disk on window 8.1? How to format windows 8.1 hard drive? How to format disc in windows 8.1? Windows 8.1 format a disk? Format new drive windows 8.1? How to reformat hard disk in win8.1? How to checkdisk on windows 8.1? How to format a drive windows 8.1? How to create and format drives in window 8.1? Windows 8.1 formatting a new hard drive? How to create partition from cdrive in windows8.1? Formatera disk i windows 8.1? Format c drive in window 8.1? Windows 8.1 show all hard disks? Format a drive in windows 8.1? Win 8.1 format hard drive? Winodws 8.1 format new drive? Hot to format a hard drive windows 8.1? How do you format a hard drive in windows 8.1? Format disk for windows 8.1? Windows 8.1 hdd formatm how do you format your drive in windows 8.1? Win 8.1 recognizes drive how do i format? Keyboard shortcuts to format a new hard disk? How to format windows 8.1 drive? How to format hdd windows 8.1? How to format new hdd win 8.1 in cmd? Format hdd in windows 8.1? How to format a drive in win8.1? Format another hard drive in windows 8.1? How do you format a drive in windows 8.1? Windows 8.1 how to format disk in command prompt? New simple volume format windows 8.1? Reformat drives with Windows 8.1? Format disk with windows 8.1? Quick way of formatting windows 8.1? Reformat hard drive in Windows 8.1? What is the right hard drive format for windows 8.1? How to partition and format a hard disk in Windows 7 Comand promot? How do you format a hard drive on windows 8.1? How to format windows drive in windows 8.1? Windows 8.1 how to format hard disk? Format disk in win 8.1? New hard drive create new partition? How do you format a disk on windows 8.1? Format a drinve in windows 8.1? Microsoft windows 8.1 format hard drive? How to format hdd in windows 8.1? Format new hard drive windows 8.1? How to format hard drive in windows8.1? Download software to format new volume (C:)? How to create a file in c drive automatic formatting? Formatting a windows 8.1 hard drive? How to format disk in windows 8.1? How to partition external hard drive using window 8.1?